Based on the number of writers employed and mentioned on the website, treatassignmenthelp.com isn’t a very popular service. 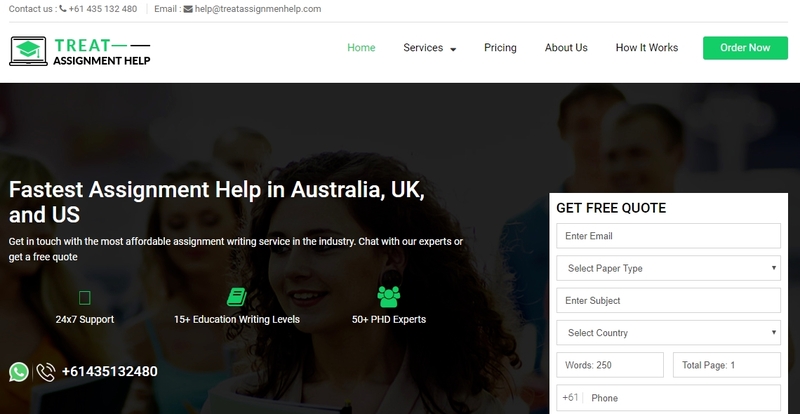 Despite the fact that they say to provide help in Australia, UK, and US, fifty writers signify a small number of orders when compared to popular companies on the Web.The website is well crafted and combines much useful information, but there isn’t a sample you could look at to see how the company handles writing projects. Despite the fact that they offer assignments in programming, accounting, economy, and many other subjects, their list of services remains rather limited.Perhaps the reason for this is their lack of services or the reputation of delayed deliveries, but to know for sure, keep reading this treatassignmenthelp.com and all the details it provides. The free calculator lets visitors check the prices for papers, but the list is so limited, you can only get access to a couple of paper types and their rates. By checking the different pricings in this calculator, you will see that some of the papers are affordable, while others are surprisingly expensive. For example, a research paper within 10 days costs $10.23 per page, while an essay with the same deadline costs $31.77 per page! The thing that is even more peculiar is that these prices do not depend on academic level, but solely on paper type, deadline and number of pages.The thing that is most surprising is that at Treatassignmenthelp.com, dissertations are cheaper than essays. A dissertation within 7 days costs $31.23, while an essay costs $33.77 per page. As previously said, the range of services is not at all satisfactory. Less than a dozen is too limited for a writing company. However, you will find an option called ‘other’, which you can use to request other types of services. For such requests, you’d have to wait for a quote and confirmation, since there isn’t a price provided in the calculator for anything else than those couple of paper types listed there. The prices we mentioned are the prices offered, nothing more, and nothing less. There isn’t a single discount or special offer found on the website, nor are there features that accompany different quality options. A lack of loyalty program can make everyone reconsider choosing Treatassignmenthelp for their regular provider, while the lack of a first-time discount isn’t very inviting on a market where almost everyone offers at least 10% to new customers. Treatassignmenthelp.com has a non-stop customer support, and an effective one. Their support agents are responding to queries instantly, providing friendly and professional assistance. Many customers have complained about delayed deliveries which were not resolved by the customer service or actually backed with the guarantees mentioned on the site. In such cases, customers reported that the customer support only offers free revisions within a limited period, even when the deadline is already missed by one of their writers.Such behavior is not acceptable in a market where there are companies who guarantee timely delivery. Treatassignmenhelp.com has a strange pricing and no offers for loyal customers, which makes it obvious why their number of employees is so low. This company is not popular at all, and the reasons for that are very clear.